St Hugh’s Fellow and Professor of Physical Oceanography David Marshall has contributed to a new study on the phenomenon of Atlantic meridional overturning circulation, a deep-ocean process that plays a key role in regulating Earth’s climate. 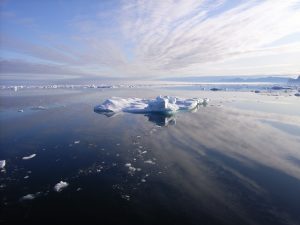 The study, led by Duke University and the UK’s National Oceanography Centre, and involving researchers from Oxford and the GEOMAR Helmholtz Centre for Ocean Research, is a departure from the current generally accepted view that most of the overturning and variability occurs in the Labrador Sea off Canada. Instead, the study found that it takes place in regions between Greenland and Scotland. The paper, published in Science, is the first resulting from the initial five-year phase of the Overturning in the Subpolar North Atlantic Programme (OSNAP), a research project in which scientists have deployed moored instruments and sub-surface floats across the North Atlantic to measure the ocean’s overturning circulation and shed light on the factors that cause it to vary. Primary funding came from the US National Science Foundation’s Physical Oceanography Programme and the UK Natural Environment Research Council. Additional funding came from the European Union 7th Framework Programme and Horizon 2020.